Are you looking for new strategies to build a loyal fan base? Wondering how to engage with readers and experts? 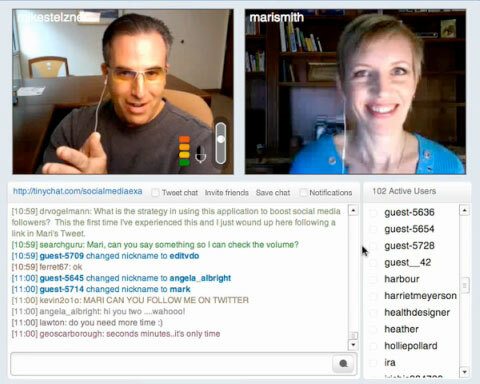 Social Media Examiner will host a free online broadcast Monday, June 6. You’ll be able interact live with four marketing experts over three hours of free online video broadcasts. Join Michael Stelzner (author, Launch), Mari Smith (co-author, Facebook Marketing), Joe Pulizzi (co-author, Get Content Get Customers) and Jay Baer (co-author, The Now Revolution) for three hours of FREE live instruction. You can ask all of your content, relationship and social media marketing questions live. How Does This Free Event Work? Are you wondering how sites like Social Media Examiner have grown large and loyal followings? Do you want to know how to build powerful alliances with experts? Social Media Examiner wants to help you get inside the “art and science” of content and relationship marketing. Experts will come to you live from their offices, answering your questions. In a series of three live video events, Mike Stelzner will join authors Mari Smith, Jay Baer and Joe Pulizzi. During each interview, you’ll be able to ask your questions about how the pros use content to grow their businesses and how to build strategic relationships with industry leaders. Come to one interview or all three to find inspiration and practical tips on how content and relationship marketing can build a loyal fan base for your business. All you’ll need is your web browser. Who should attend: Ideal for any business owner or marketer seeking to grow their following, fan base and business. Where: Online, so you can attend from anywhere. On Monday, simply click here to go to our conference room. No registration is required. Cost: Free! And there’s no registration required! Feel free to invite your friends. Michael Stelzner: Michael is the founder of SocialMediaExaminer.com (one of the world’s largest business blogs), and author of the books Launch: How to Quickly Propel Your Business Beyond the Competition and Writing White Papers: How to Capture Readers and Keep Them Engaged, and the Social Media Marketing Industry Report. Mari Smith: Mari is co-author of the book Facebook Marketing: An Hour a Day. Fast Company calls Mari the “Pied Piper of Facebook.” Mari has mastered the use of compelling content on Facebook and Twitter to build a raving fan base. As a social media business consultant, Mari helps her clients leverage the power of Facebook, Twitter and other social sites, grow their fan base and sell more products and services. Jay Baer: Jay is a tequila-loving, hype-free social strategy consultant who works with major corporations and their agencies to successfully integrate social media. A founder of five companies and a digital marketing pioneer, he’s worked with more than 700 brands (including 26 of the Fortune 1000) since 1994. He’s the co-author of The NOW Revolution, and his Convince & Convert blog was ranked as the world’s #3 social media blog by Social Media Examiner. Joe Pulizzi: Joe is co-author of Get Content Get Customers, recognized as the leading handbook for content marketing. As a content marketing evangelist, he founded the Content Marketing Institute, which includes the client–vendor matching site Junta42, as well as the forthcoming content marketing event, Content Marketing World. Will you attend? Please help spread the word and leave your comments in the box below.